From the first sale. I was delirious. I am heading out to an estate sale this morning. 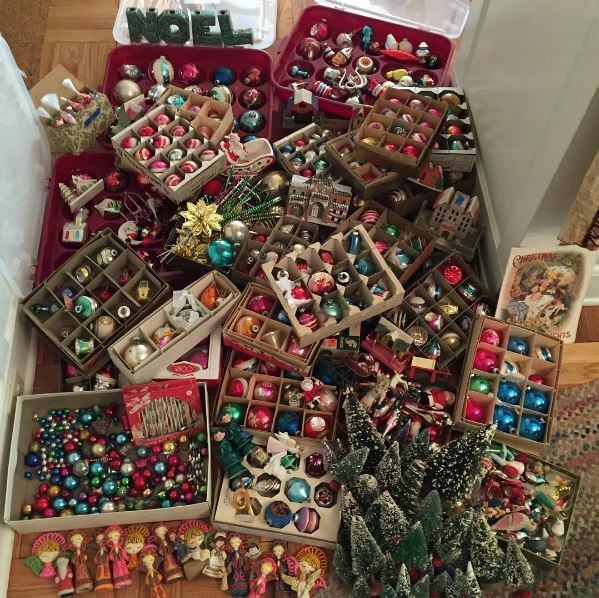 It’s Wave #2 of the estate sale where I scored a gazillion vintage Christmas ornaments and bottle brush trees (above). It was EPIC. I got there at 5:45 a.m. to sign the list to get in. I was number #12 — or maybe #8? — and made a mad dash for the vintage Christmas ornaments. SCORE! This is an estate sale of a couple who ran estate sales <<– STOP! Think about that! Wave #2 includes all the stuff taken out of their storage facilities. I’m not sure there will be as much for me at this second sale, based on what I see in the photos online. But hey, it’s all about the hunt. I am getting up early again. Why do I run my own business and work from home if not to get up at 4:30 a.m. to go wait in line at an estate sale when it’s 20 degrees out. Wish me luck! Revisit my eight tips to shop an estate sale. Be sure to read the comments, too: Readers always have great ideas too! Perhaps you have a few more! I, too, go to Estate Sales. I get fabric to make quilts for the missions (so it has to be good fabric), but I also furniture and kitchen stuff for myself. I’ve purchased a vintage bedroom set (bed, dresser) for my spare bedroom; a 1965 Motorola TV console (which I converted to hold my newer tv); a Hi Fi record/radio console for my knotty pine bar (my Hi Fi…is the same one in your doll house – with the louvered doors). I must have 3 or 4 sets of cocktail glasses in their carrying case…Argh! Did you ever go to an Estate Sale and get so “blinded” by the love and excitement of a terrific item only to come home and discover your treasure was broke, chipped or damaged? Or, later realize there is a vital obsolete component or piece missing? It has happened to me so many times that I now take a few minutes to “calm down” from the Estate Sale “rush” and give it a more thorough look. For glass or ceramic items, I gently run my hand over an item for any obsolete small chips or damage. This is a simple tip has really helped me avoid bringing home damaged items that I would have resisted had I noticed the flaw before purchasing. HAPPY HUNTING !